The export value of bananas in Laos during the first six months (Q1 and Q2) of this year decreased compared to the same period last year and is expected to decline further. The government has set an ambitious plan to increase the annual export of timber and teak products to China, Thailand and Vietnam to at least 30,000 cubic meters by 2020. Laos has taken steps to pursue its plan to build a railway network that will connect the landlocked country with its neighbours, the rest of the region and the world, railway authorities told visiting news editors from Asian countries. Vientiane is planning to reduce labour intensive rice cultivation with the number of labourers working on rice farms to be cut in half by 2020. The government has opened the Lao Worker Status Adjustment Office, the first of its kind, in Bangkok, Thailand on Aug 28, 2017. 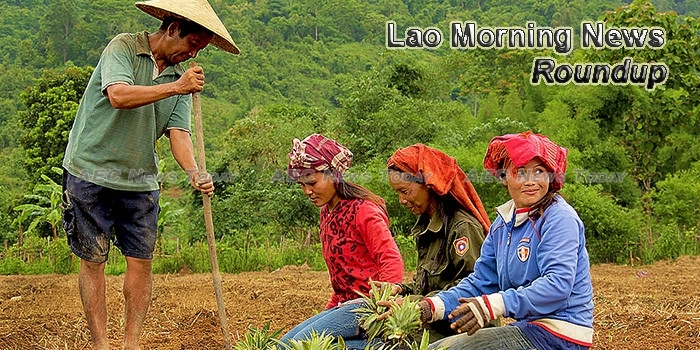 The deadline for booking a place at the 41st Southeast Asian Seminar for “Economic Development in Laos and the Greater Mekong Region has been extended to 10 September. Prime Minister Thongloun Sisoulith has urged the government to closely monitor and assess the impact of international situations on Laos, while maintaining security and social order in the run up to Visit Laos Year 2018. Estimates for 2018 put the new intake of civil servants at about 3,000, with the actual numbers subject to final approval by the government, an official in charge said. The Institute Francophone de Medecine Tropicale (IFMT) has been handed over to the Lao Government to manage. One of my most memorable trips abroad was a month-long excursion to Laos, where I can still feel the heat from the som tum (green papaya salad) on my tongue. It was a trip that introduced me to the wonders of padaek (fermented fish sauce) and lemongrass. An international drug-dealing duo ended up cornered by authorities from both their nations in Stung Treng on Friday.